Director of The Native Plant Center, the new Executive Order. 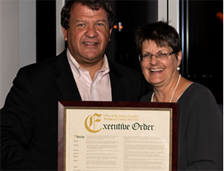 Westchester County Executive George Latimer has revised an executive order to protect the county’s natural ecosystems and environmental health. Executive Order 10 calls for native plants to be used exclusively in county parks, public areas, gardens, roadsides, and other county properties and facilities. Installation of plant species that are noted to be invasive are prohibited. The Native Plant Center was instrumental in the creation of the initial executive order regarding native plants in 2001 and worked with Latimer’s office to update and reissue the order. He made the announcement at our 20th anniversary dinner in September 2018. “It is my hope that this Executive Order will promote public awareness and education, and serve as a catalyst for the general public to use our native plants in private and commercial landscaping,” Latimer said in a press release.